Do you have a homeschool litmus test? Do you have something up to which you hold all resources, scheduling ideas, books, projects, clubs, curriculum, etc? If you don't, let me offer you Phillippians 4:8 as the foundation of a litmus test. Whether you're at the beginning, end, or smack dab in the middle of a homeschool year, chances are, you have resources and curriculum on the brain. At the end of a homeschool year, you begin to think over what didn't work and what you'd like to try instead. At the beginning of a homeschool year, you are making choices for the coming months. In the middle of a homeschool year, you are tempted to ditch some things and try yet another resource, once again changing course mid-stream. This is the ever-present coming and going of the tide for a homeschool mother. Then, of course, you open your internet browser and are overwhelmed by the onslaught of options, ideas, and information. Even after you've made your choices, every time you open your news feed you encounter yet another resource or idea that someone swears by. These things will never cease to flood your days, no matter how you guard against them. Hence, the need for a litmus test. Here's the truth, Momma: we often spend more time choosing, preparing, researching, and pondering books than we do reading them. We spend more time building the perfect schedule than we do following it. We spend more time contemplating how best to teach our children all that we believe that we should be teaching them, than we do in forming and fostering the relationships that are necessary for teaching anything. My advice? Stop the madness. Hold everything up to a litmus test. Ask yourself, "does this fit a need that I currently have for something true, honest, just, pure, lovely, good, virtuous and praise worthy?" First of all, is there a need for this thing? If you already own and are using something that is good, true, and beautiful for a certain subject, then you needn't be spending your time examining and contemplating yet another book for that subject. Your time would be much better spent actually using what you have and have planned. Second of all, if there is a true need, does this book or resource meet my ideas of truth, goodness, and beauty? It doesn't matter one iota if the book or curriculum is the current fad, everyone's latest favorite thing, what your mother used, what your best friend insists is the best, or what a stranger in a facebook group says. What matters is that it will meet the need of your children for truth, goodness, and beauty in each and every course in the feast. What matters is that it is true, honest, just, pure, lovely, good, virtuous, and praise worthy. Use a litmus test, Momma, and then keep your eyes on the course ahead of you, not on all of the shiny things on the sidelines. Trust the God who will work all of your efforts together for your children's good. Winter is a wonderful time for nature study, despite our natural tendency to huddle indoors and only emerge when the first signs of spring appear. Each season offers so very much to behold and observe of God's design of the world around us, and winter is no exception. 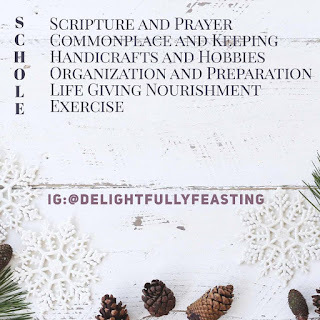 Here is a little roundup of things to assist you as you bundle up and go study Creation in its most dormant, but nevertheless thrilling, season. Simply Charlotte Mason has this wonderful list of Winter Nature Study Ideas. Browse it, choose a few, and get outdoors! Bird Study is perfect for winter, and here is a list of some myths and facts about birds in winter to springboard your discussions and observations of birds. This post, as part of Brandy Vencel's 31 Days of Charlotte Mason series, is about nature study in general,but it has some helpful ideas about studying nature in winter, and it's a wonderful read about nature study, no matter the time of year. Winter by Dallas Lore Sharp For your nature lore this winter, consider reading the classic book Winter. If you don't own or use Exploring Nature With Children, you should. It is a wonderful curriculum all year long, and the winter weeks do not disappoint! "A phenology wheel is a visual representation of what is happening month by month, in the natural world around you. A super quick and easy way to incorporate nature study into your home education, keeping a phenology wheel is a smashing way for you and your family to connect both with nature and each other. A way for all the family to gather together to spend time nature journaling; it's perfect for families who have children of different ages and stages. Everyone can work together, but at their own level. If you'd like to find out more, the Raising Little Shoots Phenology Wheel Guide is a 33 page, photograph heavy guide, to help you step by step, set up your own phenology wheels for the year. It's currently on sale at $6, no code needed." For cultural studies, I recently discovered Gap Minder's Dollar Street. This is perfect for examining the lives of people around the world, and understanding the differences and more importantly, the similarities, between people. There is an abundant amount of possessions that can be examined all around the world through picture, and this can provide hours of cultural study and discussion. If you don't already use Material World and Hungry Planet, then you will love them both if you love Dollar Street. Have you seen the news about this fabulous new magazine for Mother Culture? 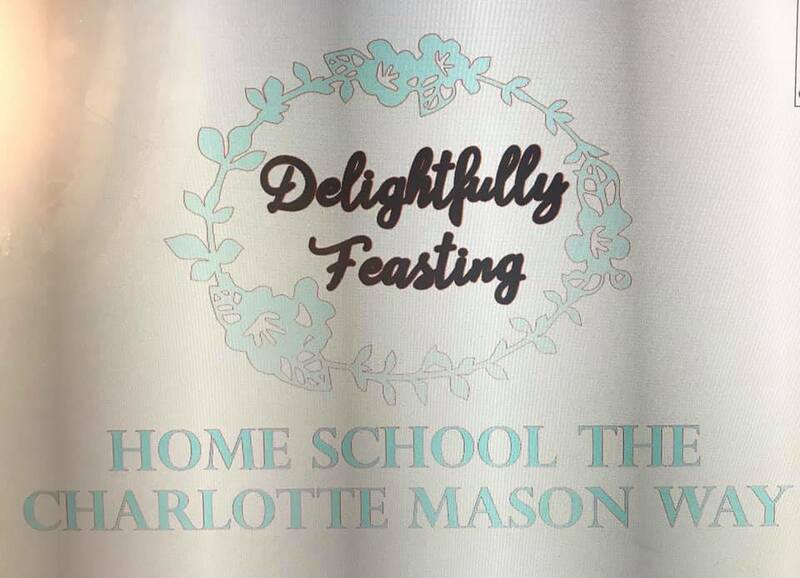 The magazine will contain both inspiring and practical content about the Charlotte Mason method, contributed by an all-star list of Charlotte Mason royalty. Not to mention, it is simply beautiful! The first edition can be pre-ordered now. Also, are you a member of the Delightfully Feasting- A Mother's Feast facebook group? Each week, we discuss a different aspect of SCHOLE, share our commonplace entries, talk about books, and share what we've gained from our schole and mother culture. If you don't yet have a SCHOLE tracker, bookmark, or planner, contact me to purchase one. 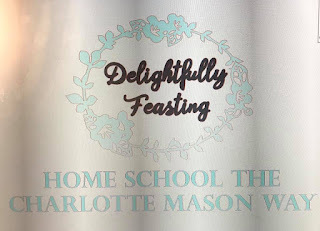 Just like everyone, Charlotte Mason homeschoolers are trying to determine what to gift their children with this Christmas. As our educaton is living, so can (and should) be our possessions. Who truly needs more plastic toys, right? Here is a round-up of some Charlotte Mason Gift Guides. Did you see the exciting news?!?! You can now purchase Delightfully Feasting coffee mugs, t-shirts,car decals, and tote bags! You currently have to be a member of our facebook community to order, however, so join us in our pursuit of a living education, and grab your DF swag! When you feel tempted to attempt the utterly impossible task of teaching your children all that they need to know, remember that this isn't your task. You are not about the work of teaching everything, and it could be argued that you aren't about the work of teaching at all. 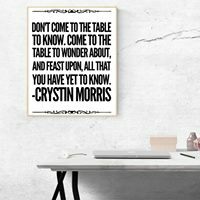 You are facilitating the feasting upon ideas and the encounter with truth, goodness, and beauty. You wouldn't truly want your children to feel as if they have learned all that there is to know, because that can never be. And he who doesn't realize how very little that he knows forfeits the wonder of what else there is to discover. You are raising wonder filled learners. You are raising those who will always know how little that they know, and will also seek to discover truth, goodness, and beauty. This means that you aren't attempting to finish every page of your math curriculum, read every book on a topic, or check every box on your list. The closing of the back cover of a book, with all pages completed, doesn't mean that anything has actually been learned. Encounters with the best ideas, through the best books, meeting the best minds and having grand conversations about all of these things guarantees that much is being learned. More importantly, it guarantees that much will continue to be learned for a lifetime. Practice what you say that you believe, friend, and stay the course. Don't attempt to teach everything, attempt to raise those who continually learn. Another great edition of The Dish. It sounds like you've been spying on me based on the first paragraph...ha! Thanks for helping me keep my perspective. You have listed a number of great resources again, and I am looking into several of them. Merry Christmas and Happy New Year! Thank you for faithfully commenting to let me know that people are reading! I was spying on myself, but I am glad that it helped you too. ;) Let me know what resources you end up finding to be useful...I would love to hear. The list of winter nature study ideas from SCM is great. The myths and facts about winter birds was perfect for me because we are still focusing on birds in our nature study and I wasn’t sure how that would work during the winter. I’m going to read the book Winter for myself and possibly use it starting next term for our nature lore. 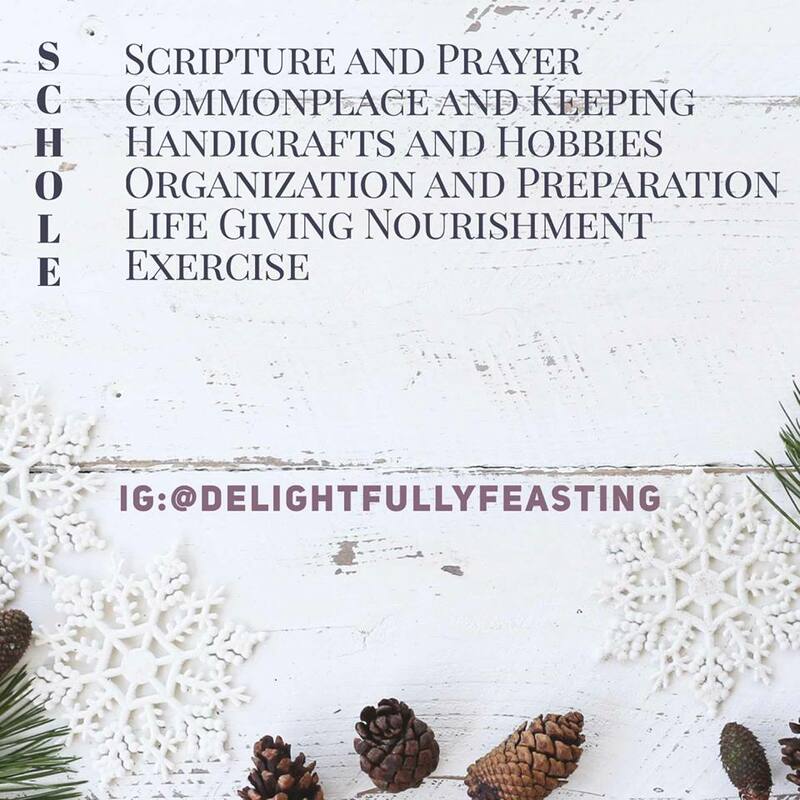 The gift list for CM moms helped me a lot as my resolution for 2019 (like last year��) is to educate myself more consistently through your SCHOLE method. All very helpful and perfect timing for me. Thanks again!